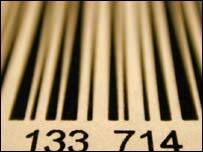 Will RFID mean barcodes can RIP? The future of barcodes could be in jeopardy after two major technology giants announced a partnership to make the chips and systems to replace them. IBM and Philips said they are to jointly develop RFID (Radio Frequency Identification) technology for shops. RFID tags send out radio signals so that items can be tracked at all times, cutting out the need for scanning. Privacy groups are concerned about the use of radio tags, but analysts say they could help shops manage stocks. As part of the deal, Philips will manufacture the radio chips which can be put on anything from clothes to razor blades, and IBM will develop the computer services and systems to manage the technology. Retail companies think the technology could be invaluable in keeping track of stock and inventories of goods. RFID technology is currently expensive, but the cost is predicted to drop which means more retailers could consider using it. The chips themselves are thin and small. As well as location, they send information about a product to a receiver that can read the signals, like details of packaging, expiry dates, colour and price. Civil rights groups have voiced concerns about this technology for some time now. They worry it means people could, in theory, be tracked by tags in their clothing. But, according to advocates of the technology, the tags could be used in future consumer goods to make life simpler for people. For instance a washing machine fitted with the tag could tell if a red sock had slipped into a white wash. Trials of the technology have had a mixed response. US retail giants, Wal-Mart, dropped planned to tag razor blades after protests from consumers. After privacy concerns from size-sensitive New York shoppers, Prada's trials suffered resistance too. But in October 2003, Marks and Spencer in the UK became one of the first shops to test tags on men's shirts, ties and jackets. It says that by tagging clothes with RFID chips, it would be able to pin point the precise location of any of its 350 million sold annually. 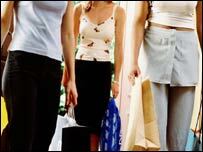 According to research analysts, the RFID market is estimated to be worth $3.1 billion (£1.7 billion) by 2008. Analysts IDC have predicted retail demand will be $1.3 billion (£7.1 million) within four years.